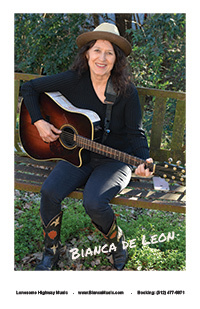 Townes Van Zandt’s “White Freightliner Blues” in a minor key makes perfect sense when performed by Bianca De Leon, once Townes’ close confidant, now carrying on his tradition of mixing the darkness and the light in her songs of love and loss, innocence and experience, with the emphasis now firmly on experience. 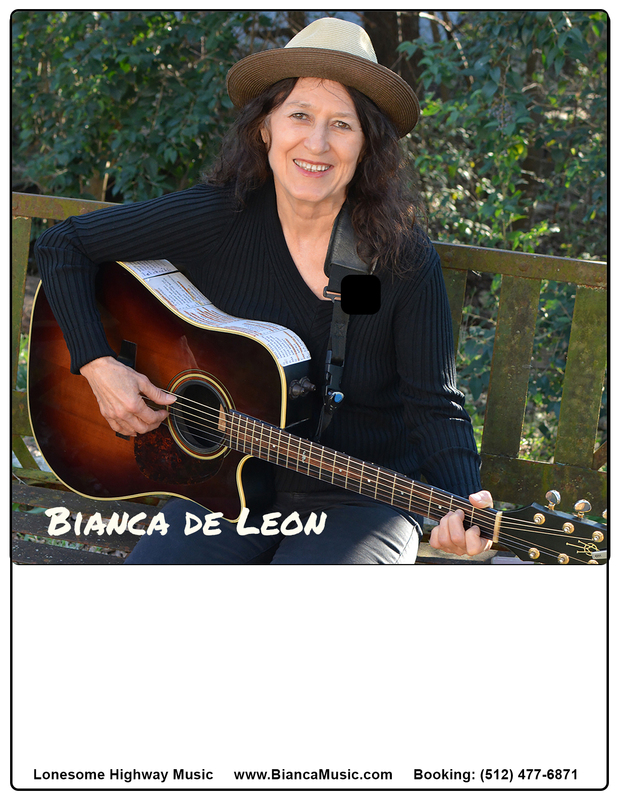 A world-weary cover of Hank Williams’ “I Heard That Lonesome Whistle Blow” marks the other boundary of Bianca’s territory, conveying strength and resolution along with the resignation of hard fought experience. 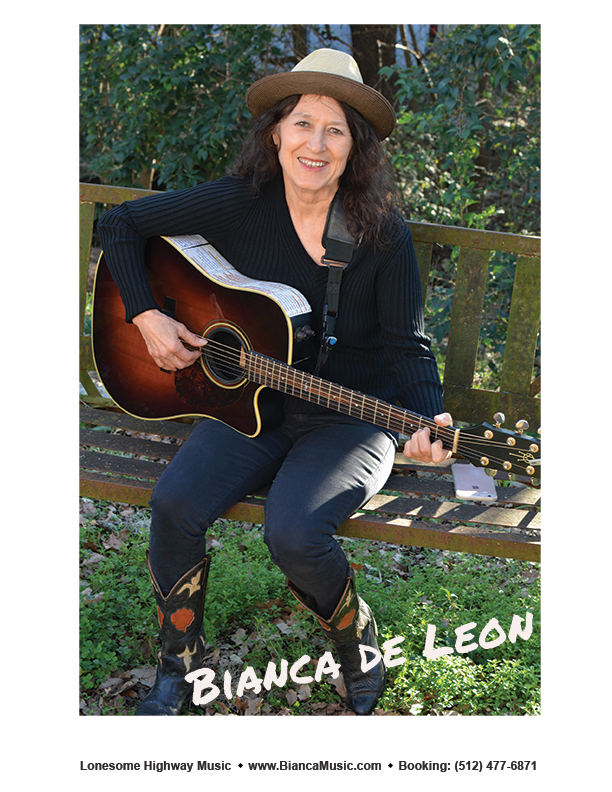 In between, her latest songs continue to weave the threads of the stories her followers have come to love over the years: solid songwriting and a voice that gets better with age – and experience. 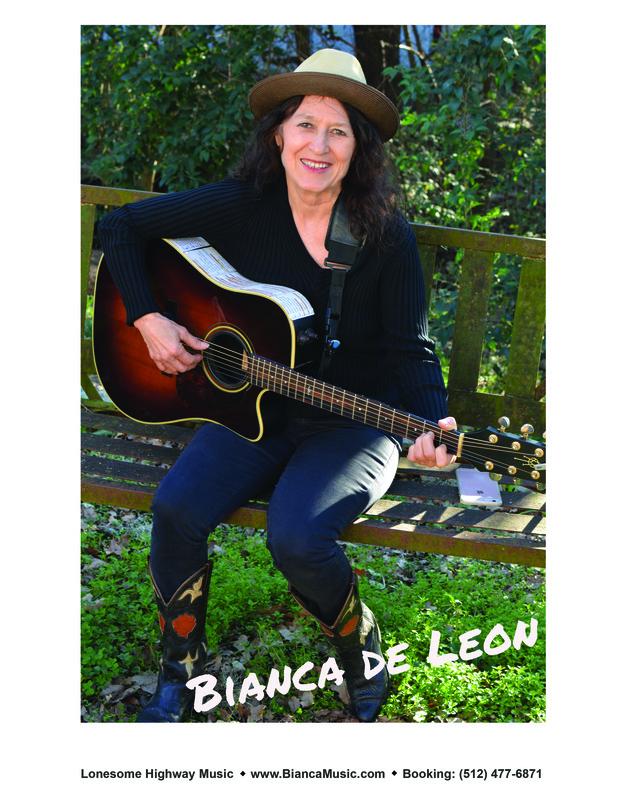 As a young girl in south Texas, De Leon learned to smuggle tequila across the border under her petticoats, and she became familiar with cantina life, with desperadoes and secrets oscuros. She left school and was drawn to the road, hopping freight trains, living everywhere from Santa Cruz to Sonora, from Nashville to Bogota. Dark, quiet, and ever observant, she was already fashioning her life into the substance of here art, singing of love and loss on the borderlands of love and loss, of adventure and romance, and of uncertainty and danger. When she sings of outlaws and lovers, she sings like she’s lived it and she means it – and she has, and she does. 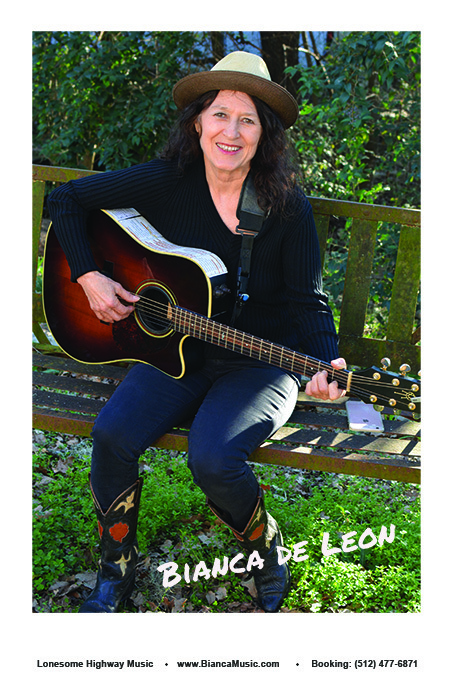 Dangerous Endeavor is De Leon’s fifth release. While she plans to tour extensively in the United Sates this year, she is already lining up shows in Europe where she is already a celebrated artist known for her “cuts-to-the-bone” voice and her insightful, honest songs. 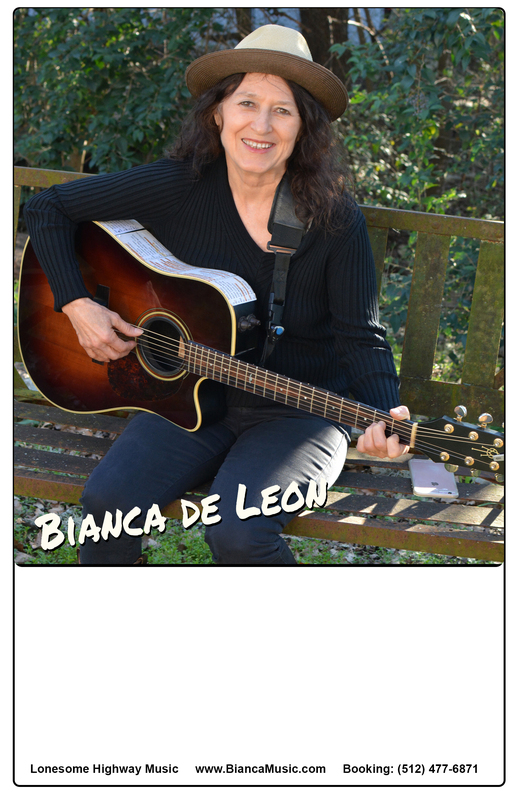 Through the universality of her songs, De Leon’s music bridges all borders – geographical, cultural and emotional. “Outlaws and Lovers” – EU release. Film Short, 2012 – Hemeras Eclipse, by Kathy Swift Albert, starring Mika Abdalla, LeeAn Gomez & Bianca De Leon. 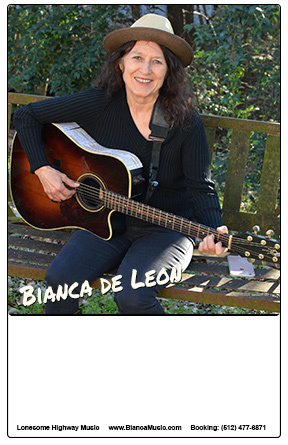 The film included Bianca’s song “Buscando Por Ti” used for the credit roll, and for the trailer. Film – Cut Off (starring Faye Dunaway, Malcolm McDowell, Amanda Brooks, and Ann Archer), and was featured at Cannes Film Festival. The film included Bianca’s song “Six Pack of Misery”. 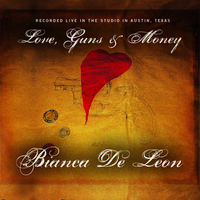 Video Game – Bianca’s song “High Timin’ Girl” was licensed for the video game “Big Mutha-Truckers 2”. The jpegs below are 300dpi and ready for newspaper/ flyer reproduction. 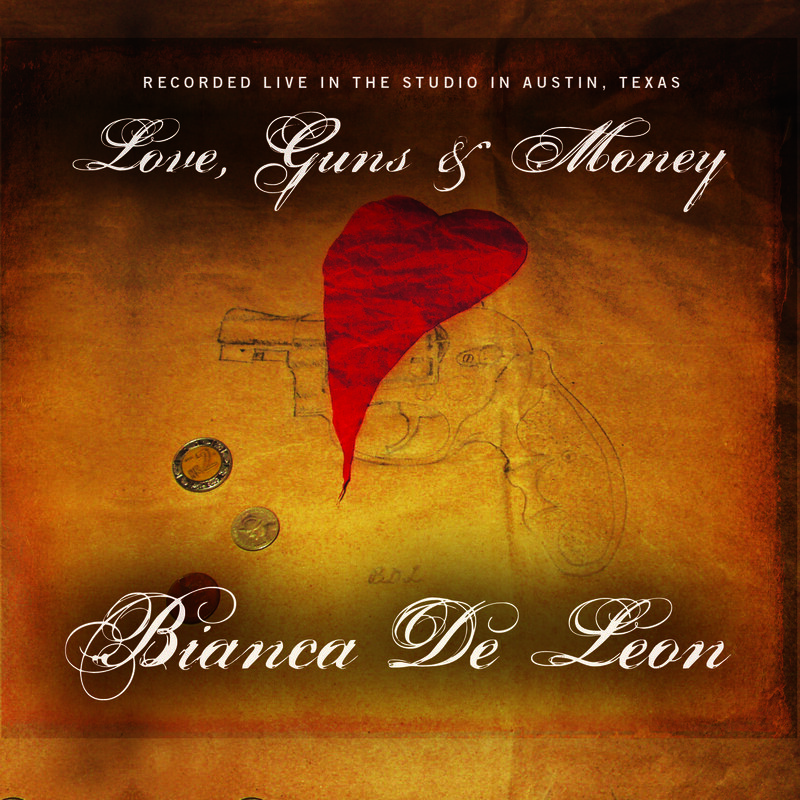 Photographs are © Bianca DeLeon and are used with permission.